I’M BACKKKKKKKK!!!! That’s right for those of you who thought I was buried 6 feet under… guess again… i’m are alive, kicking, and ready to show you the 2013 Spring trends! So here is what i’m going to do… write a long BORING list of what kind of things to expect in 2013 BLAH BLAH BLAH, and then show you guys how to wear it (the fun part!). To top it off i’m going to mix my best-dressed Grammy 2013 outfits, with some of the trends.. I know everyone has price limits and all that Jazz, so i’m are giving you different brands/sites for both sexes. Let’s get this show on the RUNWAY…CAN I GET A WHATTT WHATTTT! xo. Monochrome is on all of the catwalks this season, from Alexander Wang to Topshop it’s time to Cruella Deville yourself up in HERE! The first outfit is for all the BALLERS out there with extra cash to splash. It is available on Net-A-Porter , from the Marc by Marc Jacobs collection. This stunning dress can be dressed up or down with footwear and accessories. This dress is perfect as it highlights your waste and has a slight flare at the bottom (for all of you whose New Year’s resolutions went down the drain, this dress will hide those extra pounds you haven’t shifted yet .) The second outfit is designed by Osman Yousefzada, 17 Grammy winner Beyonce looks ABSOLUTELY FABULOUS in a (what you Americans call it) Pantsuit. Beyonce pairs her outfit with matching black accessories. The final item is a combined coat from Zara, this coat is what I call timeless chic . To emphasise the monochrome… remember FASHIONBOTS less is more, so take a tip from the Queen B herself, and pair your monochrome with simple accessories and footwear! xo. Capes (not the batman and robin kind of capes, think chic.) I j’adore capes and guess what… it’s unisex this season… that means guys and gals you can both wear capes. xo. Flat and Low heels are back in business! Think 90s, 90210, from dainty ankle straps to cylindrical heels. The first and second pair of magnifique Nicholas Kirkwood flats can be found on Net a Porter. The orange suede heel, compliments the pattern on the shoe making it… QUIRKY. The final pair are from ASOS, these heels will always finish your outfit making it Mrs. Boombastic say me fantastic touch me in my back he says I’m Mrs Romantic. The great thing about these flat and low heels are THEY ARE BASICALLY FLAT! This means comfortable footsteps. One step for man one leap for mankind. xo. Stripes are back again (but be careful, stripes do not suit everyone!) The Striped top is designed by RED Valentino. Teamed with a colourful pair of jeans, with (hint FLAT AND LOW HEELS) will leave you looking extraordinaire. The dress is from a Newlook concession, its figure-hugging bodycon material is REEM and everyone will be well JEL (The only way is Essex???) and you will be drowned in compliments. Ohhh shutttt upp!!! xo. Oriental from Prada to River Island stunning Japanese silhouettes and oriental floral prints will be blossoming this spring. Expect to see them everywhere! The first dress is from Emilio Pucci. The dragon Motif is brilliant, as it emphasises this trend. I would pair it with Flat or low heels and a plain black clutch. 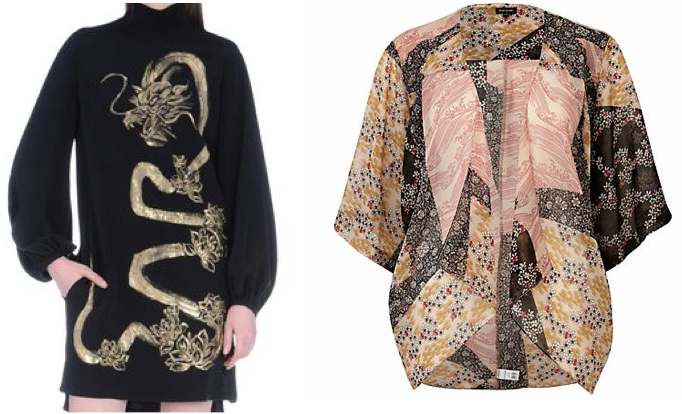 The second item is an oversized Kimono from river Island, this oriental trend will help to brighten up your spring wardrobe. thanks for the comment! cool blog, definitely better than the average fashion blog 🙂 we will keep on reading! Yea, great blog! I’ve been looking for something like this to help inspire my fashion since (or lack there of).